Off East Coast Road, near Still Road and the Marine Parade Community Centre and library. 2-bus stops to Parkway Parade Shopping Mall. 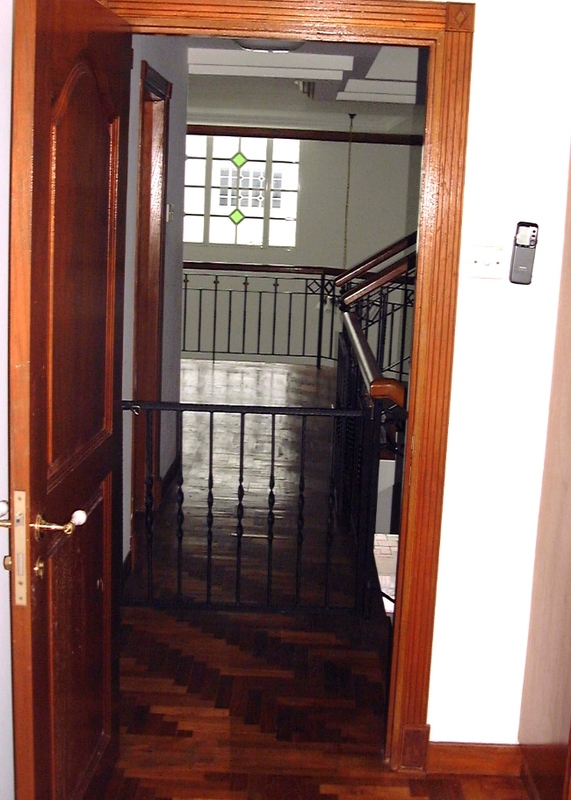 Restored one-storey semi-detached with 2 bathrooms, 1,300 sq. ft built in. Lease will be for one-year only as the owner may re-develop the site in 1.5 years' time. Your own car porch. Buses to Suntec City in 8 minutes. 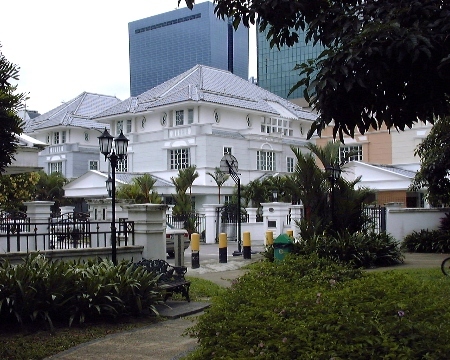 Near to Marine Parade Library and community centre. Food and beverage cafes nearby. Many taxis. Suits Caucasians who want to live in history. NO cable connections. 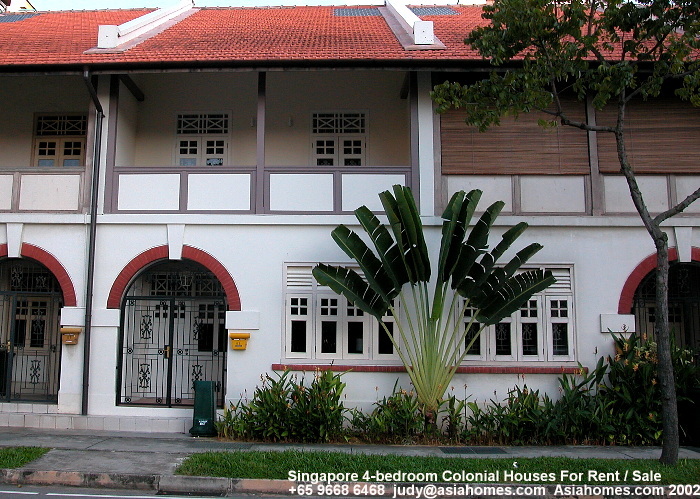 Expats who need cable services, please do NOT rent such houses as there are no connections from the main road. 71 units, completed in 1996. A development with a large Caucasian community. 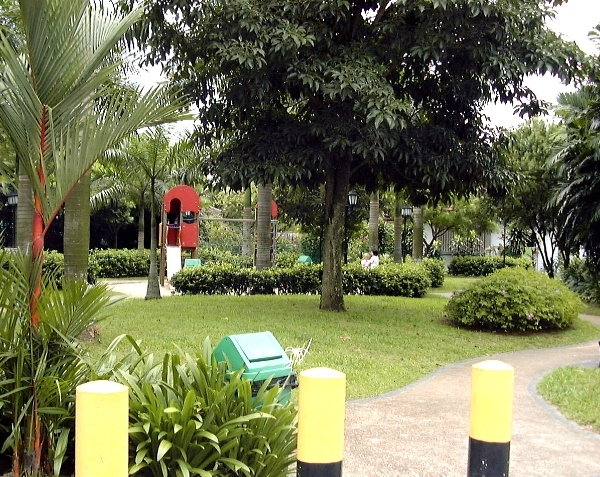 Gentle Villas Park and playground. Near the Novena shopping mall with the Novena subway below in a 5-minute walk. The Cold Storage supermarket in there too. Mainly Semi-detached houses: Land area 205-361 sq. m. Built-in around 260 sq. 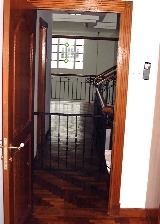 m. 3-storey. 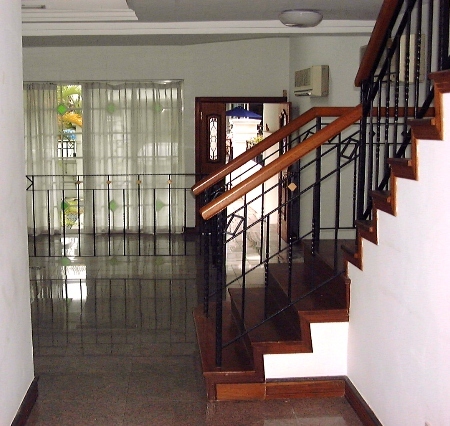 4-bedrooms on level 2 & 3. One guest room on level 1 and 1 small maid's room sufficient for one bed. Land area 410-798 sq. m. May have a spa pool. Rentals $8,000 - $10,000 per month. Small piece of land. Not possible to install above ground pool. Bay windows. Good-sized master bedroom with attached bathroom: bath tub and shower stall. Small patch of grass at side unless tiled by owner. A one-car car porch but no extended patio. Quiet area with big park. A mosque is outside the subdivision. 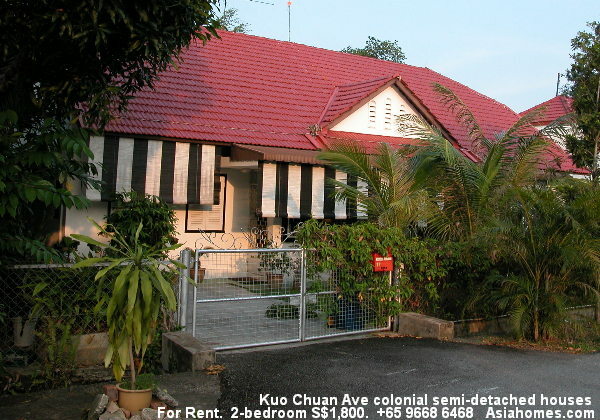 High occupancy rate, due to proximity to Novena subway and a 3-minute drive to Orchard Road and the American Club. Living rooms are dark grey granite tiles with diamond spots in centre. 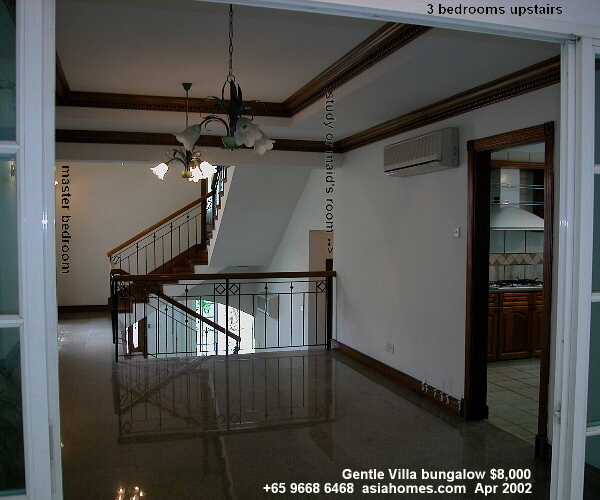 Great location near the Novena subway and shopping mall. A 5-min drive to downtown Orchard Road or Suntec City. A Caucasian expat enclave with many young children. 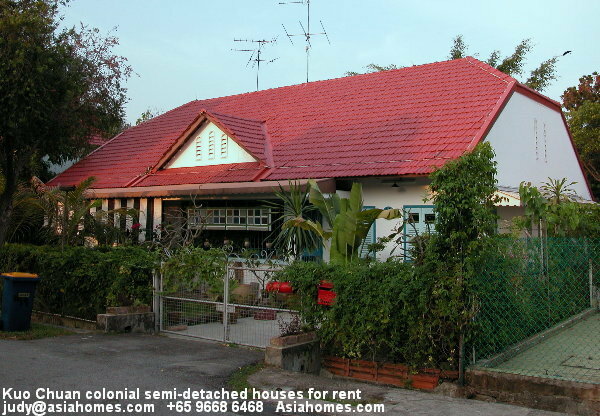 The 5-min walk to Novena subway and a short drive to Orchard Road and the American Club makes this subdivision a great attraction for expatriates with small kids and rental budget around $6,000. The expats' main complaints: The kitchen is small, the "maid's room" just fits a small bed and one unit is near a mosque. No pool or other condo facilities, but there is a health club nearby. Some mothers worry about the toddlers and kids climbing over the railings of the family area on level 2, but this subdivision has many such toddlers. Split level dining (front) and living area. 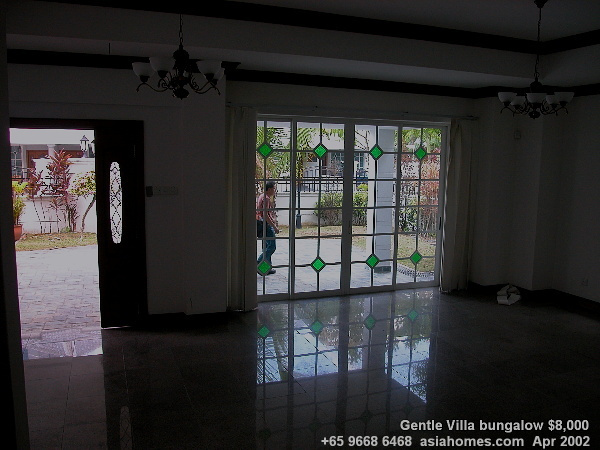 Lots of natural light from front and side sliding doors. Kitchen and maid's room to the left (back of photo). 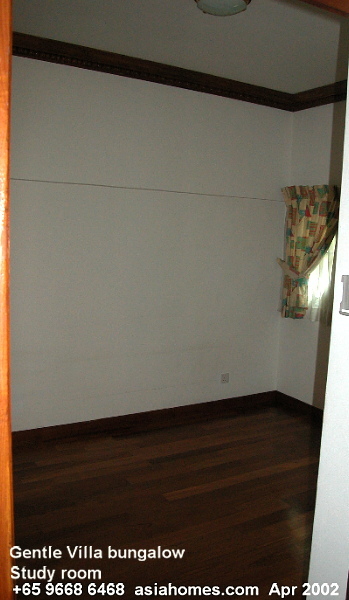 Bedrooms are of parquet flooring. Level 2. Family area in foreground overlooks living area below. It causes child safety concerns for some anxious mothers with small kids. Great location. 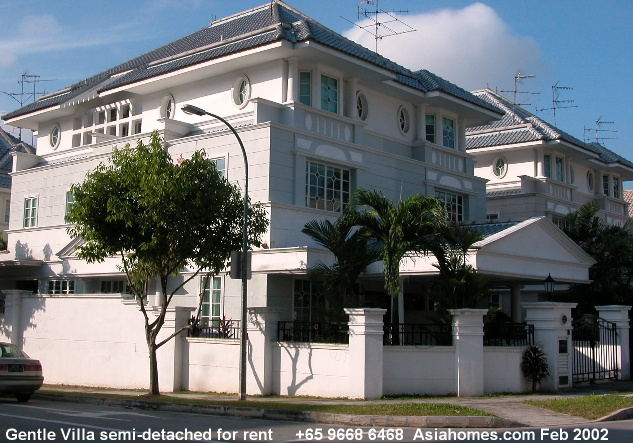 A 5-min walk to Novena subway and 2-min drive to downtown American Club or Orchard Road. Air conditioned and bright kitchen. Maid's room outside is very small. family area. Bay windows in bedroom. 2 bedrooms with attached bathrooms. master bathroom. 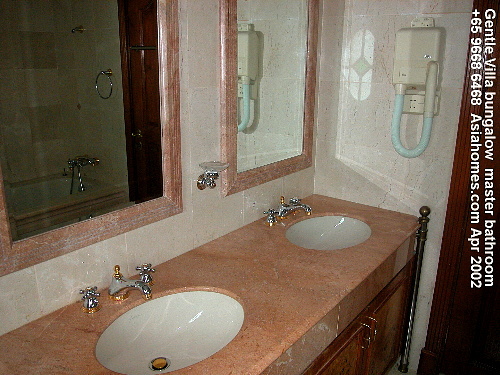 Dual basin master bathroom. Shower and white long baths. Marble clad bathroom walls.